This female was found at night hunting on desert pavement about 10 meters from a wash. She is almost 20 mm long. Vekol Valley, Maricopa County, Arizona. Aug. 16, 2008. Wolf spiders use silk in constructing their egg sacs but not for building snares (except Sosippus). Instead they use their vision and special vibration-sensitive setae - trichobothria - to hunt for prey. Mostly they are sit-and-wait predators, i.e. they emerge at night and move little from a likely spot. Any soft-bodied insect or even another wolf spider that wanders close is pounced upon and stabbed with the chelicerae which deliver the venom. There are eight eyes in two rows. The front row of small eyes faces forward whereas the second curving row has two large and two much larger eyes. There is a reflective tapetum behind these large eyes that makes the spiders easy for naturalists to locate with a head light. 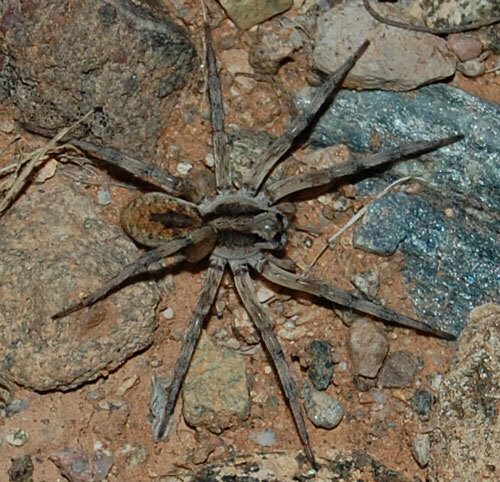 'Lycosa' has traditionally been used for the large free-roaming wolf spiders of North America. Recent taxonomic investigations have revealed that their are several unrelated lineages of wolf spiders thus included which now each have their own generic rank.